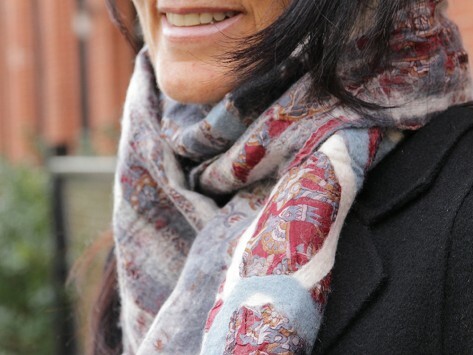 Upcycled scarves from The Red Sari are made by felting merino wool designs on top of vintage sari silk. These beautifully textured, one-of-a-kind accessories give women in Nepal fair wage work in exchange for their artisan skills. Dimensions: 74" x 12" x 0.15"
The colors are subtle and lovely, and it is truly a work of art. Can't believe the price for this! Gift for Christmas. Recipient seemed very pleased with the scarf and immediately proceeded to wear it for the rest of the day. The beautiful fabric from second-hand saris fills the open markets in Kathmandu. The Red Sari gives this vintage silk cloth new meaning, turning it into felted sari scarves. It’s a stunning combination of design and texture, with colorful merino wool circles felted onto the fabric. The Red Sari was founded by Julie West after she traveled to Nepal. She empowers local women with fair wage work, using their artisan skills to repurpose saris into one-of-a-kind accessories. The company reinvests profits into hiring (and thereby helping) more and more women. Whether you give one of these meaningful scarves as a gift or wear it yourself, it’s a lovely way to support a better way of life.